It’s just natural to assume a prophet knows what he’s talking about, or that he or she knows God better than the rest of us. But no matter how powerful their revelations are, few prophets seem able to free themselves immediately, if at all, from their limited understanding of God. Sometimes God even has to send a big fish to get a prophet on the right track; and if they ever do transcend their common humanity, that transcendence sometimes doesn’t last very long. Such is the case with perhaps the most glamorous Old Testament prophet, Elijah the Tishbite. His growth as a prophet is the central drama running from the 17th through the 19th chapters of I Kings. 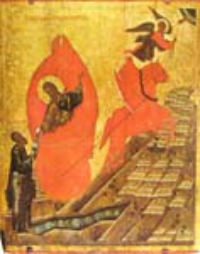 Elijah ascends to heaven in a chariot of fire. On the one hand, no can doubt Elijah’s stature. In the New Testament he’s identified with John the Baptist and with Jesus himself, and during Jesus’ transfiguration it’s he and none other than Moses who appear together with Christ. (1) Elijah kept good company. His Old Testament doings are equally spectacular, so you often feel that anything less than his ascension to heaven in a fiery chariot would have been anti-climactic. His servant Elisha’s words, “My father, my father, the chariot of Israel and the horsemen thereof!” are among the most thrilling farewells in all literature (II Kings 2:12). Yet when I look at I Kings 17-19, I’m strangely impressed not so much with Elijah’s greatness as with his very odd cowardice. He prophesied a drought, saw the miracle of the never-ending meal barrel and oil cruse, revived a widow’s dead son, and called down fire from heaven to defeat the prophets of Baal. Yet all these things didn’t seem capable of sustaining this personal courage or his faith in the God he was working for. The narrative of his growth is carefully and beautifully structured. It begins suddenly and ironically in I Kings with the images of miracle and flight. With no introduction or fanfare, Elijah appears to announce a drought as punishment for King Ahab’s wickedness, after which God commands him to run and hide by the brook Cherith. There God sends ravens to feed him, and apparently all is well—until the brook dries up. It’s only been six verses since he prophesied the drought, so you sense pretty keenly that Elijah has become a victim of the very thing he prophesied: the drought. This little irony prepares us for a major one: Elijah, prophet of God, is ultimately victim of his limited view of God. As rain water falls on the just and unjust, so brook water dries up on both, too. In our story God does indeed perform miracles involving earth, wind, fire, and water—not to mention oil, bread meal, and life and death, when he is with the widow and her son—but the God of Israel’s main distinction is not as a manipulator of the natural world. Everyone seems, however, to realize this truth only dimly. Truth, or faith, or moral commitment cannot live very long on miracles (2), and because Elijah looks too much to the miraculous he, of all people, seems to understand poorly that God must work at deeper levels of the human heart to achieve lasting effects. Each succeeding miracle in chapters 17 and 18 places Elijah center stage with more and more prominence. Because he exits so quickly after prophesying the drought, we get little sense of who he is. The unwasting meal and oil, however, is a prolonged miracle linked directly to his presence with the widow. When he brings her son back to life she exclaims, “…by this I know that thou art a man of God, and that the word of the Lord in thy mouth is truth” (I Kings 17:24). And on Mt. Carmel Elijah is in full glory, holding center stage intensely, zealously, and with a nearly vulgar chutzpah bordering on the comic as he commands his enemies to poor more and more water on the sacrifice he’s going to call his God to burn up. His stature grows quickly and spectacularly in Israel’s national life and in the reader’s mind. That’s why we’re stunned that all it takes is a word from King Ahab’s wife, Jezebel, to crush his courage and make him cave in so quickly (I Kings 19:2). Although on Mt. Carmel Elijah reverently repairs the altar of the Lord, taking “…twelve stones, according to the number of the tribes of the sons of Jacob” (I Kings 18:31), his main pronouncement is, “…the God that answereth by fire, let him be God” (I Kings 18:24). Now, the people may have listened to nothing less—Jesus complained of people always demanding signs—but Elijah himself seems also to be too much taken with the God who manipulates nature rather than the God who should, because He is true, own peoples’ hearts. In fact, Jezebel seems to display more strength and conviction than the prophet of the true God. Elijah flees from that strength. 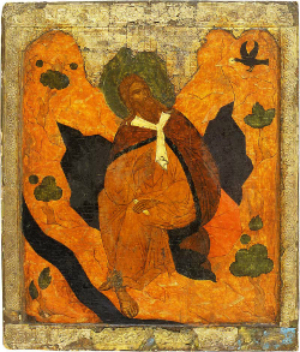 Elijah’s second flight (I Kings 19:3) echoes his first flight to the brook at the beginning of the narrative, but with one important difference: God commands the first flight, Elijah’s cowardice causes the second. No doubt Elijah is God’s man; and God again ministers to his needs, this time through angels. But God also asks this convicting question: “What doest though here, Elijah?” (I Kings 19:9) Elijah answers out of the depths of despair, but you feel his answer to be self-centered, and certainly misinformed. More about this soon. Immediately following Elijah’s answer comes the famous scene (I Kings 19: 11-13) where God passes by causing gale winds, earthquake, and fire. The narrative began in Chapter 17 with an implied rejection of God’s deep saving presence through water: droughts come, brooks dry up. Now the other three members of the elemental quartet are also repudiated. Wind, earth, fire, and water are not the deepest vehicles of God’s work. In the Judeo-Christian concept, the God who gives rise to nature is also above it, separate from it. This doesn’t mean we should treat nature irreverently—nature is a manifestation of God—but it does mean that we must rise above nature worship to worship God in truth. In the larger Biblical context of God’s progressive revelation of himself, this passage is a milestone. It is a high point in God’s struggle with both the Chosen People and others to impress upon them the distinction between a transcendent God and a man-made nature god. That’s what Baal (a sun god) and Asherah (represented by Jezebel’s prophets of the grove in 18:19) were two popular examples of. I Kings 19: 11-13 has drawn much comment, the main message being that God speaks most profoundly not in thunderous accents which address man’s natural senses, but in quiet, powerful whispers addressing the heart. We hope that Elijah’s courage and moral fiber have been deepened by the expansive vision that God’s “still small voice” does and must exceed miracles of earth, wind, fire, and water. The man who prophesied the drought and called down such natural marvels as he did on Mt. Carmel needs to know how preliminary those miracles are. The lack of that knowledge is probably the root of his cowardice when he faced Jezebel. We aren’t directly told that such growth has occurred. In fact, he gives the same kind of sniveling answer when God asks a second time what he’s doing there at Mt. Horeb, why he’s fled a second time. The symbolism of the story, however, seems to indicate a kind of rebirth for Elijah. The place to which he has fled is Horeb, the Mount of God, a mountain not only far away from Ahab at the Promised Land’s southernmost extreme, but also the place where God identified himself to Moses as the Great “I Am in Exodus 3. After a fast of forty days and forty nights, Elijah arrives at Horeb to receive another lesson about the Great “I Am,” and some have speculated that the cave he lodges in is the very same “cleft of the rock” God puts Moses in when He passes by(Exodus 33:22). Elijah leaves Horeb strengthened, hopefully, by his encounter with God, and further bouyed by God’s news that many faithful await to join him. On his way back, Elijah chooses his servant Elisha in a scene closely paralleling Christ’s calling of his disciples. We also note that Elijah performs no miracles here but appeals solely to Elisha’s sense of moral obligation and commitment to God. Elijah’s fight against Israel’s wickedness and false gods is about to begin in earnest. Perhaps the question of Elijah’s growth is left ambiguous because the demand for wondrous signs is one of humanity’s permanent weaknesses. Certainly, in the face of such wickedness as Ahab and Jezebel’s, courage without miracles seems problematic. Yet if we ask if that kind of courage occurs anywhere in our text, the answer is, Yes. At the beginning of chapter 18 as Elijah returns to Ahab to propose the contest on Mt. Carmel, he runs into Obadiah. Elijah tells Obadiah to tell Ahab that he wants to meet him. The scene that follows (verses 9 to 15) seems at times to cast the protesting Obadiah in a slightly comic light, even though he protests out of a real fear that Elijah will again disappear and Ahab will slay him for bringing a false, taunting message. Yet we learn in verses 3 and 4 that Obadiah, out of fear and devotion, has, on his own, “…took a hundred prophets of the Lord and hid them by fifty in a cave, and fed them with bread and water.” It’s significant that this detail is delivered quietly—in fact in an actual parenthesis. This quietness echoes God’s “still small voice.” This, God tells Elijah at Horeb, is why he will not be alone, even as Elijah is crying “poor me, I’m all alone, the only true prophet left.” He’s wrong. As God fed Elijah, so Obadiah fed God’s prophets. Obadiah did this on his own, without miracles. Elijah had to journey to Mt. Horeb to understand such courage. NOTES: (1) Identified with John the Baptist: Luke 1:17. In fact, the penultimate verse in the Old Testament (Malachi 4: 5) promises that God will send “Elijah the prophet before the coming of the great and dreadful day of the Lord.” Identified with Jesus: Matthew 11:14 and many other places. At transfiguration: Matthew 17: 1-3. All quotes from the King James translation. All other references given in parentheses. (2) I do not speak of the miracle of life itself, or of the Incarnation or Resurrection. Such miracles are different in kind than those “minor” ones we see in our narrative and elsewhere. This entry was posted in Faith and tagged Ahab and Jezebel, Elijah, Elijah the Tishbite, miracles, Mt. Horeb. Bookmark the permalink.